And comfort us in the dark. We use life size bear characters “TygerBear” to communicate with the children, to which traumatised children respond very well. This project was recently launched with the opening of our TygerBear Care Centre and aims to offer a physical token of love, caring and commitment to each of the children admitted at the centre. Although the centre offers a homely atmosphere the traumatized child still needs someone to hold on to, a familiar and constant face with whom he shares his day. This is the role of the hand knitted teddy bear and we trust through this initiative our children will find a lifelong best friend. The Comfort Bear Project was initiated during the 1980’s and aims to give a knitted bear to each child patient of the unit, conveying a message of hope, love ad caring. The comfort bear is an important tool for the social workers to help the children who are scared and lonely to feel special again. These bears which the children can take home are knitted by caring volunteers in the community. However, we soon realised that these teddy bears can reach much more than we originally anticipated. A teenager feeling depressed, a child who worked hard in therapy or had traumatic treatment like chemotherapy, a girl who has been hospitalised for the past 14 years, children who were injured in an accident, had a traumatic and painful operation, feels lonely and rejected or had just had an outpatient visit on a special day, for all of them we need to say “I care about you”. Very often the social workers tell us the stories, of the children lying in their hospital beds, with the teddy bear hidden under their blankets, only the ears to be seen – as though their special friend keeps their little bodies safe. These hand knitted teddy bears have become a primary tool in the therapy of our children, for not only does it carry a message of caring and love, but the teddy bear has become a confidant in whom to confide secrets and seek comfort from. An extreme example was a little boy, admitted with severe burn wounds to his face who came to our unit to choose his own teddy bear, after standing in front of the row of bears, he chose the “ugliest” one as this was, as he said: the one who looked most like him. This teddy bear carried the child through his therapy and on the day of his discharge, it was the sole possession with which he left the hospital. A basic pattern is available for volunteers to adapt to make their own unique bear friends. If you are interested in being part of this special project, please contact us for more information and patterns. This is a medium of communication and expression for the child during the play therapy healing process. 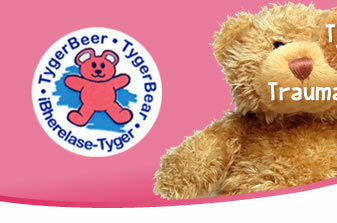 The Tribute Bears are handed to a specific person or organizations as a special tribute for their contribution and commitment to the TygerBear Foundation. By bringing this tribute we are not only expressing our gratitude but also creating a lifelong memory of the involvement of this person or organization. The interesting thing about collecting bears is that they have a past, a history and this gives them an air of mystery and intrigue that you cannot get in a modern bear. The Golden Oldies Project collects Teddy Bears from a bygone era and aims to keep their magic alive. The Tyger Teddy Bears have been invited to several special events and we have developed a whole range of bears incorporating the logo and the theme of the event, for e.g. our Culture Bears for the KKNK and our “Have a Heart for Children” range for the Heart festival in Beaufort West. The Cuddle Bear Project was borne out of the necessity of putting a human face to the Paramedic or Emergency Services, and medical services in general. They are there to give backup to the emergency crews, and to always be on hand – or paw – when a frightened or injured child needs a cuddle. When arriving at a trauma scene, whether it is a vehicle accident or domestic violence, the task of the paramedic is to bring immediate relief to the situation. Having been trained to offer basic medical assistance and aid until the patient reaches the hospital. What about the child? An innocent bystander to the scene who is left his own devices, as his injuries are not medical, but in certain ways, even longer lasting emotional scars of fear, rejection and a feeling of utter hopelessness. The traumatised child needs a friend to hold on to and to feel safe with, this is the role of the teddy bear. The Teddy Bear symbolises caring, safety and protection to the child. It shows the child someone cares! And if someone out there cares, the child just might believe everything is going to be all right. By handing this teddy bear to the child, we are diverting his attention in a positive direction. As the old saying goes: Energy Flows where Attention Goes. So even though, the paramedic is working with his back to the child, on a dying mother or father, the scared stare of the child can be directed to the face of a familiar teddy friend. The Cuddle Bears are also given to children who are undergoing treatment in the ambulance, waiting with a relative, or receiving care from ambulance clinicians. Sometimes the paramedics use the cuddle bear to demonstrate to the children the treatment they will receive, to help allay their fears. We are very grateful to the ladies for the knitting of the cuddle bears, as being treated in an ambulance can be very upsetting for a child and these bears can help take a bit of the fear away. With this teddy bear we do not only lessen the impact of the trauma on the child, but also that of the paramedic, as they have shown to the child someone cares and the child may trust them to do their best for their loved ones. A basic pattern is available for volunteers to adapt to make their own unique bear friends. If you are interested in being part of this special project, please contact us for more information and patterns. During the past few years TygerBear has received both national and international exposure through our student practical program, our unique therapy unit and various media articles. Our Bears have had the opportunity, and continues to, tour throughout the world and become ambassadors for the Foundation and each of the children who cross our path. One of our goals for this project is for a Tyger Teddy Bear to be invited to have tea with the Queen of England. During TygerBears participation at special events, festivals etc. well known performers and celebrities have expressed a love for a specific teddy bear and offered to autograph these bears for the public who purchase them. Two recent additions to our celebrity bears have been Hannes van Wyk (Krynauw from Egoli) and Theuns Jordaan. TygerBear also boasts with a collection of Teddy Bears who have been autographed by celebrities, actors, performers and sport stars such as Chester Williams, Eden, Jak de Priester and Breyton Paulse to name just a few. These bears bring a message of hope to our children as faces and names they only know from television has reached out to them by signing a teddy bear. We use bear puppets in our preventative safety programme to teach children in a child friendly manner about safety and where to seek help when needed. These bears are utilized during our Court Preparation and Hospital Preparation programs and helps to define the roles and situation as well as familiarise children with the various role players. Often children become worried by medical procedures and then have the opportunity to take teddies which are feeling a bit off-colour for a medical check-up. The project is aimed at children between the ages of 4 and 7 which is when most anxieties occur. We, at the TygerBear Foundation, appreciates the help of each person who collects, delivers, knits and makes the Teddy Bears featured in these twelve projects. I guess sometimes, grown ups forget.